How to import to Uganda? What are the import procedures in Uganda to move goods? Explain about import registration process, cargo movement to Uganda from overseas countries, Import delivery process in Uganda etc. Detail the import methodology in Uganda. This post explains about step by step procedures that need to be finished with Uganda government authority for importation to Uganda. Those persons or entities who wish to start exporting from Uganda can do so by following related streamline procedures set by Government authorities. But according to products nature, certain goods for export may be subject to an authorization, license, rules of quality or packaging, standardization or special formalities. A registered trade with concerned license as per the business is must for exporting and importing of commercial products from and into Uganda. The Uganda Customs Department administered under and by Uganda Revenue Authority is responsible for levies taxes on goods efficiently, implementation of customs policies, facilitate legitimate trade and protection of the society and legal economic activities in Togo. 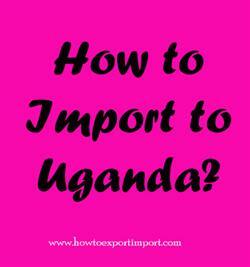 This post explains about different phases in import process that every importer needs to go through in Uganda.